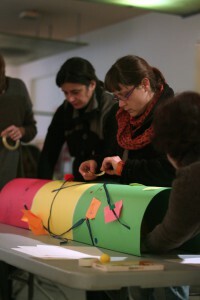 The next day, participants came full of new ideas and materials to improve what they had started the day before. 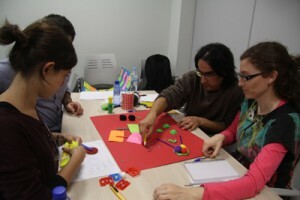 They had some time to work on their prototypes and then the iterations started. The interchange of ideas between people of the other groups promoted discussion and also constructive inputs for the proposals. At the same time, it was an opportunity to return to the group with new ideas for their own proposals. Then, they defined their final projects. 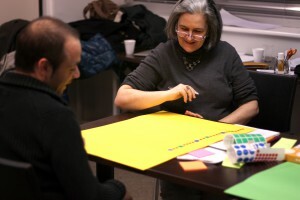 The first group summarized their ideas as ‘science expresses but humans interpret it and get emotionally affected’, which sought to identify the creative process as emotions, emotions which in turn change the creative process. It would have two areas, one ‘experimental or creative’ where real experiments (crystallization processes and microbiological cultures) would took place, and the other, a multimedia area with video screenings of the experiments and creations to provoke an emotional reaction in the visitors. This should be built by a team of experts (scientists, multimedia technicians, engineers and technical staff), always keeping in mind the pedagogical aspects of the exhibition. They estimated a total cost of 23.000€. The second group summarized their proposal with the message ‘evolution has no direction and no limits’, highlighting the need to know the past to understand the future. They proposed to build a museum that included an exhibition area with an interactive timeline, and an area of interactive games where the topic ‘evolution of technology’ would be explored. To carry it out, a multidisciplinary team would be required (biologists, designers, journalists, director/manager, volunteers) and the total cost would be 500.000€. The third group entitled their proposal ‘The Limits of Technology’, which aimed to make the visitor reflect on when should technology be stopped. It would be a virtual tour (holography, 3D, Wii) to explore three topics: health, food and energy. The idea would be to pose dilemmas about the relationship between Nature and Technology. Through the virtual tour, the visitors would be encouraged to reflect and make decisions about positive and negative aspects of each topic (moral, historical, hypothesis). The first part would show the historical facts and the second, the current and future dilemmas. To develop the proposal, again a multidisciplinary team would be needed: programmers, designers, journalists, communicators and scientists. 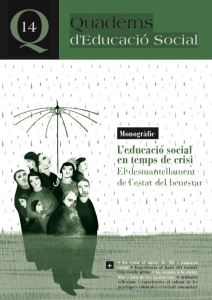 On the basis of hiring 20 persons for six months with an average salary of 2.000€/month, the group calculated a budget of 240.000€. The fourth group proposed a trip trough the ‘natural inspiration in the technological creation’, considering that nature is a source of inspiration to technology. 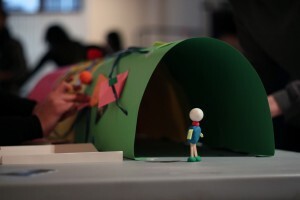 They proposed a tour through an interactive tunnel with three areas: an ‘inspiration’ zone with visual and auditory stimuli (images and sounds from Nature), a ‘discovery’ zone where the visitor would be presented with examples in which nature was used as a template, and a ‘creation’ zone to generate new ideas in a participatory way. These ideas would be projected in a big screen and the visitor would also be able to continue sending suggestions from home. To carry out this proposal one would need a team made of scientists, designers, programmers, graphic designers, and explainers. They estimated a total cost of 200.000€, but with the possibility to adapt the proposal to a less expensive, but still interactive, format. Finally, the fifth group suggested to explore ‘the two faces of technology’ in order to raise public awareness of the benefits and drawbacks of technological progress, and also that the accessibility to technology is a determinant parameter of human quality of life with a strong effect on the opportunities that one can have. 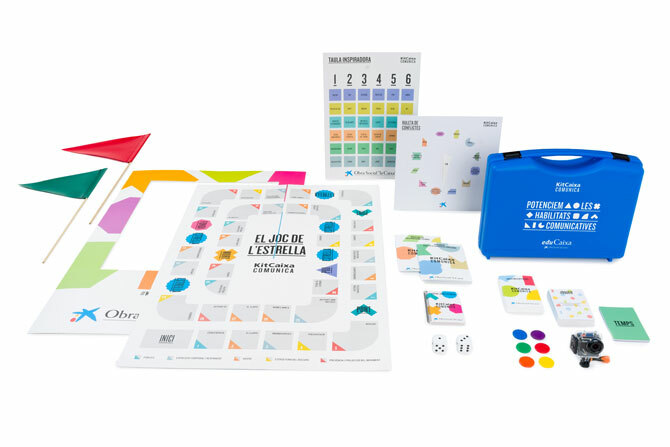 They proposed to create a tablet game (or a cardboard one) in which the players would have to create pairs of opposites related with different technological advances, focusing on six key topics. Additionally, with open questions, the participants would be encouraged to share their opinions and ideas about these topics, and stimulate transformation and change. 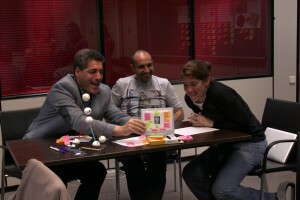 The group did not estimate how it would cost to produce this interactive module, but they underlined the fact that it would be adaptable to a wide range of budgets. Once all the groups had presented their proposals, we challenged them with a last exercise where they had to integrate all or some of the proposals into a single one, by finding a link between them. The intention was to identify the similarities, complementarities or differences between them. From the different possibilities, the groups suggested to integrate the first and fourth proposals as they highlight the aesthetic and emotional aspects of the creative process. They also mentioned the possibility of merging the second, third and fifth proposals to explore the role of technology in our society in a more complex way: the different faces of technological evolution and the need to define its limits. 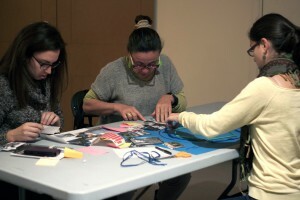 The workshop was a way to reflect on the complex relationship between technology and nature and their role of society. At the end of the session, it was clear that there are many ways to translate these topics into exhibitions, but it was also clear that there are an obvious interest by the public to participate in the creation of contents. 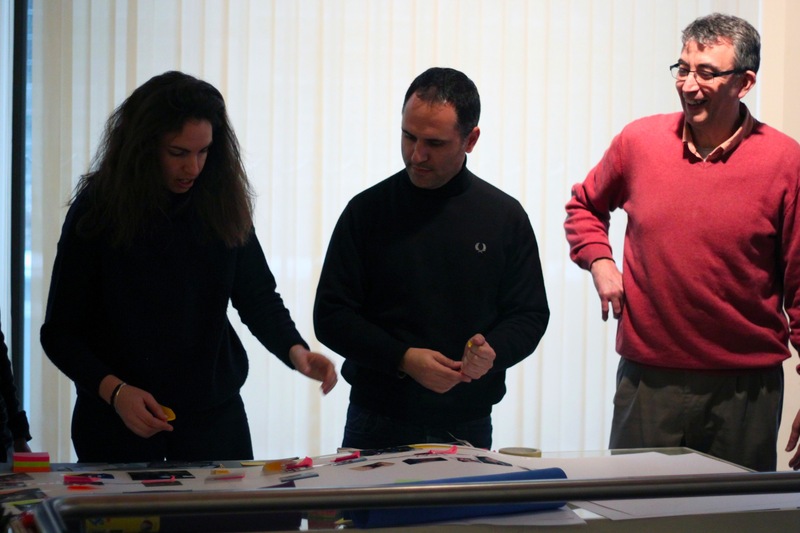 From the proposals generated in this workshop, the idea is now to keep working and exploring the nature-technology duality, with the help of new collaborators, in order to translate the results into a real exhibition. This activity was also a opportunity to explore some innovative working dynamics that favor participation and interdisciplinarity, but also an opportunity to establish new networks of contacts, or worknetting (first work together, then connect the opposite to the much abused “networking”), as Irene from La Mandarina de Newton said. 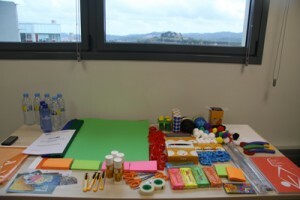 We hope this workshop will be the beginning of a new line of work for CSIC (Catalonia), open to everyone. You can find more photos in our facebook page. For more information you can also check out the website of TalentLab. 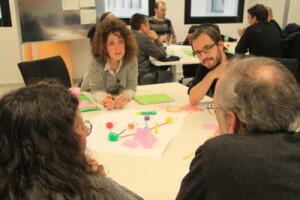 The fourth and last workshop of TalentLab II (21 and 22 of February, 2013) at the Residència d’Investigadors (CSIC Barcelona). 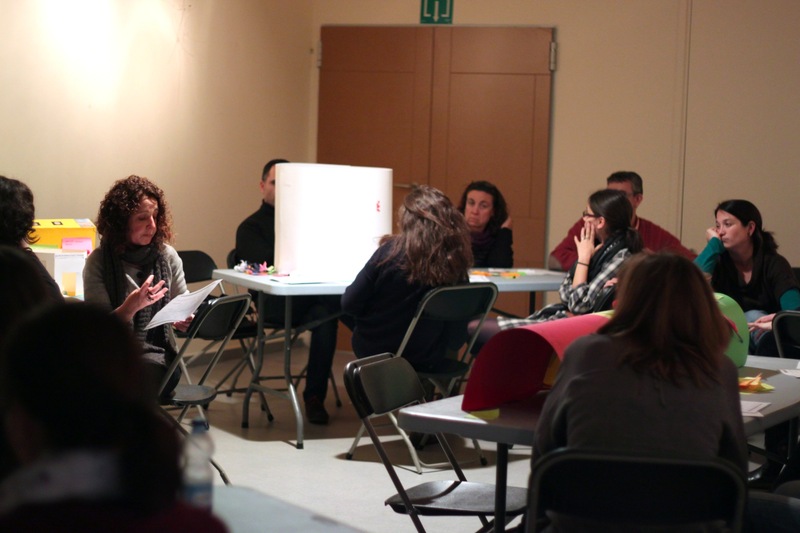 With this workshop we began a new line of work, open to the public, with which we aimed to explore and define the guidelines for a future scientific exhibition inspired on the duality nature-technology. This time, the work process was developed in two sessions and the different groups of participants evolved throughout the two days. 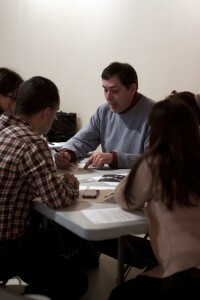 The participants were interchanging groups according to the dynamic of the sessions. Therefore, when we refer to a certain group, remember that they are not always formed by the same people. The first session began with a reflection on the nature-technology duality. Frequently, when we think about ‘nature’ and ‘technology’ we immediately associate them to pre-conceived images or ideas, and we also see them as opposite terms. Is this true? Is it easy to define in crisp, clear terms what is ‘natural’ and what is ‘artificial’? If this is not the case, why are we constantly opposing one against the other? After being prompted with these kind of questions to spark a debate, the participants divided themselves in groups. Getting inspiration from printed images. they discussed about the boundaries between nature and technology. From these provoking exercise, the first group, inspired by a picture of huge tree roots encroaching the ruins in Angkor Vat (Cambodia), emphasized the idea that ‘in the end nature always imposes itself’. They also mentioned that nature offers us technology that can be mimicked by humans (picture of a beehive). They referred to ship transport as an example of globalization due to the technological advances, and the positive (cargo transport) and negative (transport of invasive species) aspects we all should evaluate. In this sense, they also commented on the role of technology in improving life’s quality, in contrast to its use for war. 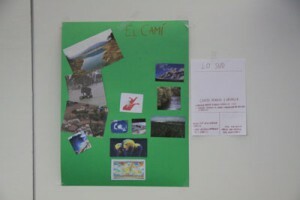 The second group mentioned nature as an inspiration to develop sustainable technology. From a picture of a earthquake they raised the idea of ‘re-thinking’ technology from the observation of nature. 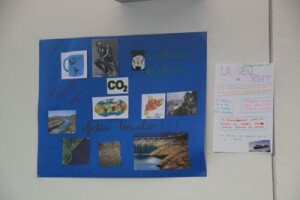 The third group remarked that, although globalization have enabled the access to more resources (goods), we have to be careful about the over-exploitation of nature. As an example of the contradictions of the globalized world (and at the same time, of the hybridization of nature and technology) they mentioned the fact that some fruits and vegetables that reach our supermarkets may have been collected more than a year ago and they just maintain their aspect due to anoxic treatments. The group also highlighted that technology should be seen as an ally. 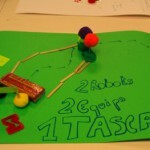 The fourth group said that ‘we are technology’. 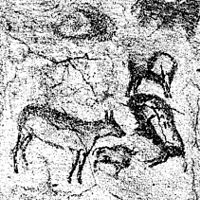 From an image of a stone, they emphasized that nature is not a static thing, it is in constant change. Contrary to what the first group highlighted, they argued that nature does not have to impose itself, simply because there is no confrontation. They remarked the idea that technological knowledge has no control over everything, over nature, although it is a widespread idea. They also mentioned the need for ‘coexistence’. A picture of a Eduardo Kac’s installation where two girls look at a live microcosmos, suggested to them ‘curiosity’ and ‘control of nature’. Finally, the fifth group, inspired by the order in a container ship and the disorder of a landfill site, highlighted the opposite ideas of order and chaos. From another image which depicted the use of DDT in the past, the group reinforced the idea that one cannot predict the consequences of the use of technology, reinforcing the point of view of the fourth group, i.e., that one cannot have control over everything. Finally, they also mentioned the topic of patents. They questioned if it is right to consider nature as an ‘invention’ and therefore, to grant exploitation rights to the companies so that they can manage natural resources, such as water. From all these ideas, participants then wrote down in post-its the ideas they considered most relevant and hung them on panels. The next step was to, altogether, reorganize the ideas into topic groups. 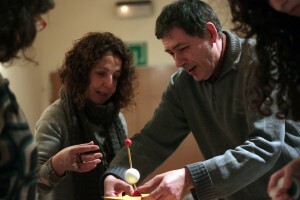 The participants ended up with six groups: inclusion-exclusion of technological knowledge, food, limits, evolution, natural models, and creation and emotion. 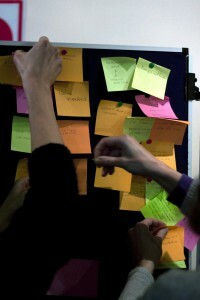 Then, each participant chose one of these topics and from this self-selection, new working groups were created. In order to maintain five groups, the topic ‘food’ was incorporated in the ‘inclusion-exclusion’ one. In order to start narrowing these general ideas, we used a creative method called ‘brainwriting’, in which everyone works for everyone. 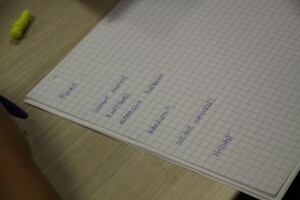 First, each participant wrote down three specific actions for each of the topics, in a complete and concise sentence. The worksheets were passed through all the members of each group and this activity generated 250 proposals. Then, individually, everyone voted the ones they found more interesting. For the topic ‘Natural Models’, participants highlighted the proposal of displaying tools and materials inspired by natural morphologies, Gaudi’s art style, natural architecture found in flowers, and industrial products inspired by nature. For the topic ‘Inclusion-Exclusion of Technology’, participants voted for a proposal which consisted in exhibiting photographies that bring to light this contrast or, alternatively, images that are not what they look like; they also voted for a world map to show where the different technologies are created and where they are used, and also proposed an activity to discuss the topic of the exclusivity of the patents regarding nature and food industry. For the topic ‘Creation and Emotion’ they chose an activity that would put the visitor in the place of a person with sensory disorders: a fear module where the human reaction to different problems would be put to test, a role-playing game to explore how it would be to live without technology (in order to realize that actually we are surrounded by technology), a soundtrack inspired by nature, the reuse of obsolete technology. For the topic ‘Evolution’ they voted for a representation of the brain in which the different parts would be illuminated to show how evolution took place throughout species, a showcase with the different tools that humans used through evolution, a representation of the mass production of food, to show how objects evolved (feather pen to ball pens, rock to high-tech tablets). Also they proposed to exhibit photographs of the same place throughout the years, and to show one object/invention and how it evolved through the years and in different ethnicities. For the topic ‘Limits’, the participants chose a proposal to bring the attention of the public towards the ethic problems related with biotechnology, an interactive game to highlight the limits (ethical, technological, etc.) of different topics, a representation of a brain of an elderly person as a symbol of our limits, and an activity to discuss about the exportation of waste by showing a mountain of waste as a way to represent human consumption. 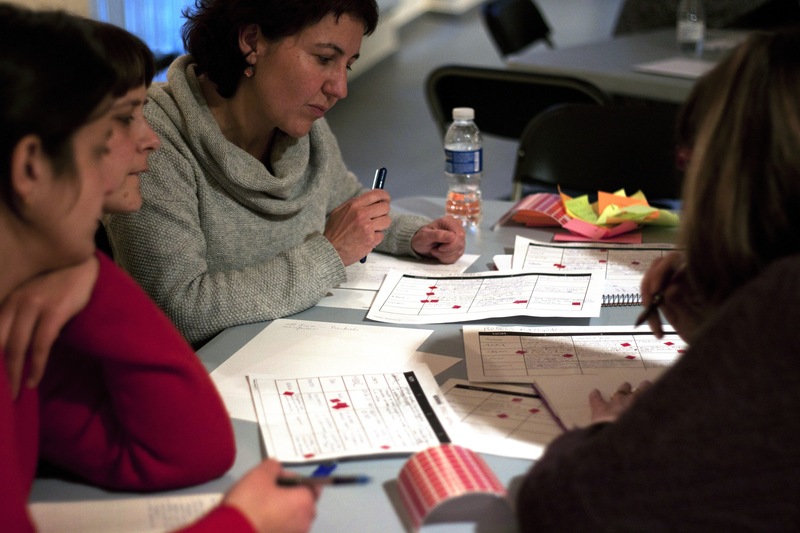 From these ideas, the groups had to define and work on a specific proposal. They had some time to clarify ideas and narrow the options. Finally, late in the afternoon, we saw the first 3D prototypes. 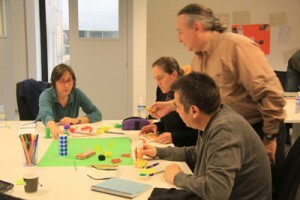 The third TalentLab workshop, ‘Near the Ocean’, took place last wednesday (February 6, 2013) at the Institut de Ciències del Mar (CSIC), Barcelona. 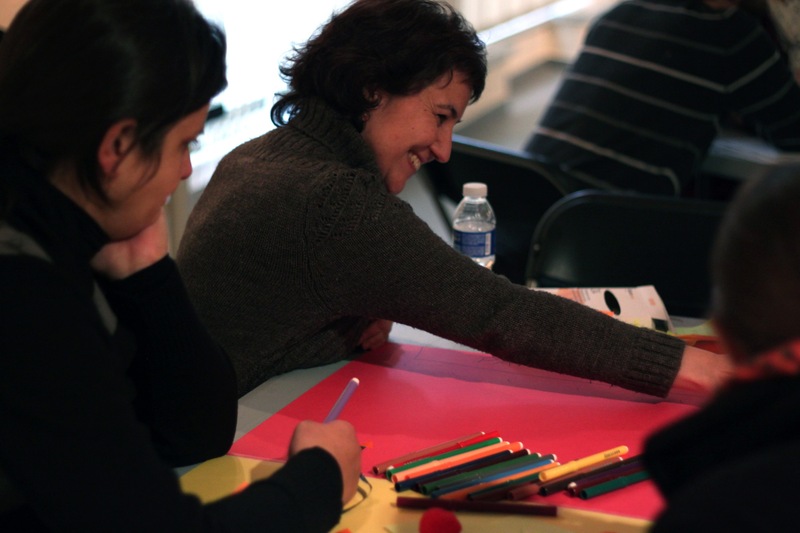 This workshop was dedicated to the marine ecosystem, focusing on the impact that humans and technology have on it. 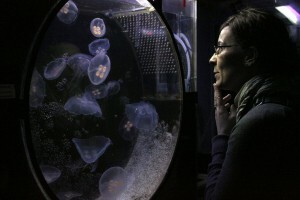 The session began with a visit to the aquarium facilities of the Institut. 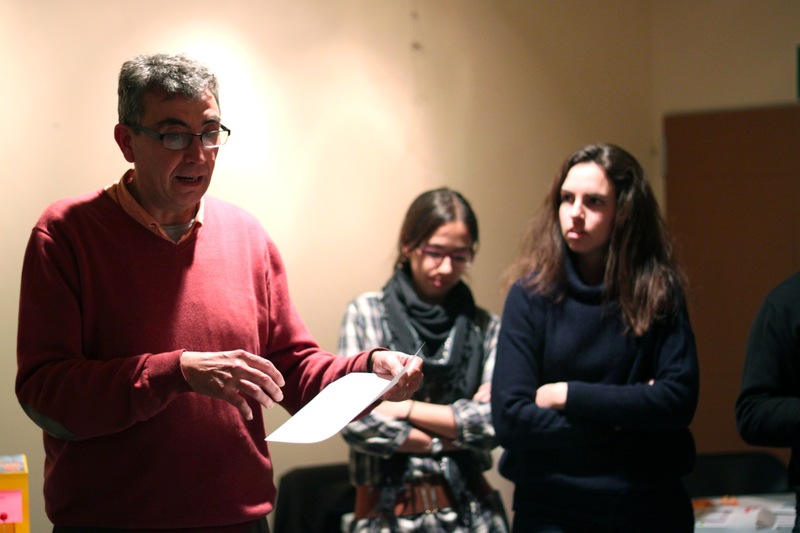 Josep Maria Gili showed us how the different marine organisms, like polyps, jellyfish, ctenophores, are maintained. He explained the difficulties in cultivating these species and the need to tightly control a vast number of parameters (light, temperature, water flows, etc.) in order to reliably mimic their natural habitat. This way, researchers are able to study them ‘in situ’ and obtain some specific data, as the growth rate, that otherwise would be impossible to get. 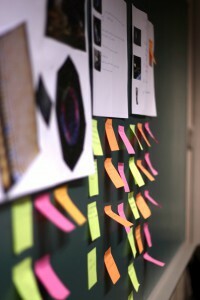 After this interestingly ‘guided tour’, we went back to the workroom and started the workshop itself. The participants divided into five groups and Irene Lapuente (La Mandarina de Newton) explained how the session was going to be lead. 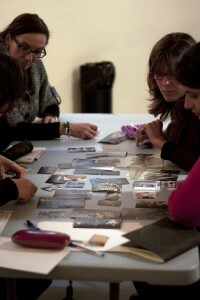 The first task was to discuss within each group the images and objects that the participants had brought. 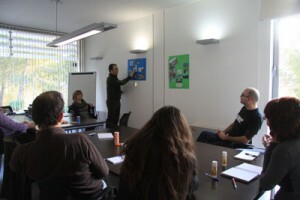 In this warm-up activity, the first group highlighted the duality of some topics: the marine monitoring systems – which importantly allow the surveillance of the ecosystems, but do not take into account the need to, at the same time, create awareness; the oil containment booms – extremely useful to minimize the consequences of oil spills, but also a huge visual impact; the cotton swabs – which are of daily use, but are also ‘destruction weapons’ for some marine animals; biodiversity vs. artificial diversity. The second group focused on three topics: climate change and the need to be scientifically rigorous when one promotes science; what people enjoy from a day on the beach (explore it, conserve it and memories), and what they don’t (overcrowding or bad smells); and the technology as a tool to reveal the seascapes, otherwise unreachable. The third group, inspired by the concept of the shark as a predator symbol, highlighted the impact of overfishing and pollution in the marine ecosystem which, by bioaccumulation, ends up affecting also the human population. The group also mentioned the impact of the huge floating garbage island and the lack of actions to reduce it. The fourth group focused on the waste, but also on the ‘artificialisation’ of the marine ecosystem: both the creation of new ecosystems, like the human-made coral reefs, and the ‘artificialisation’ of the shores. These concepts led to the topics of functionality and infrastructures, maximum sustainability, and the duality economy vs. ecology. The fifth group mentioned the need to recover some unfairly forgotten knowledge; the need to consider the past to understand the present and face the future. 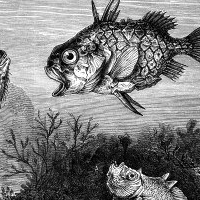 They also discussed the idea of discovering what the sea hides, as a way to reveal what has been done to it. From these starting ideas, the groups then identified the target public of their educational resources. Generally, they all chose a cheerful, curious, outgoing student, with multiple interests (music, sports, friends), with few changes in his/her life, and with some family problems. Some of the groups also considered the multiculturalism of our society and the consequences of technologies in the creation of new ‘languages’ (emoticons). In order to start defining the educational resources, the groups set the priorities and the points to avoid of their proposals. 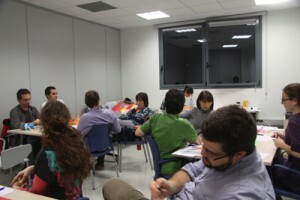 The first group aimed to encourage debate, the active participation of the students, the interdisciplinary, time-restriction, and to avoid the clichés. The second group wanted to encourage the debate and experimentation, to promote physical activity, teamwork, and to avoid the stereotypes, excessive competition and the lack of rigor. The third group stressed the need to be scientifically rigorous, stimulate curiosity, creativity and teamwork, and that it should be visually appealing, avoiding it from being too technical and theoretical. The fourth group highlighted again the need to generate debate and stimulate thinking, to be fun and visual appealing, and to avoid the typical science exhibition narrative contents. Finally, the fifth group prioritized the need to stimulate curiosity, generate questions and interaction, and to refrain the exclusive use of new technologies. After a short break, each group started to give form to their proposals. 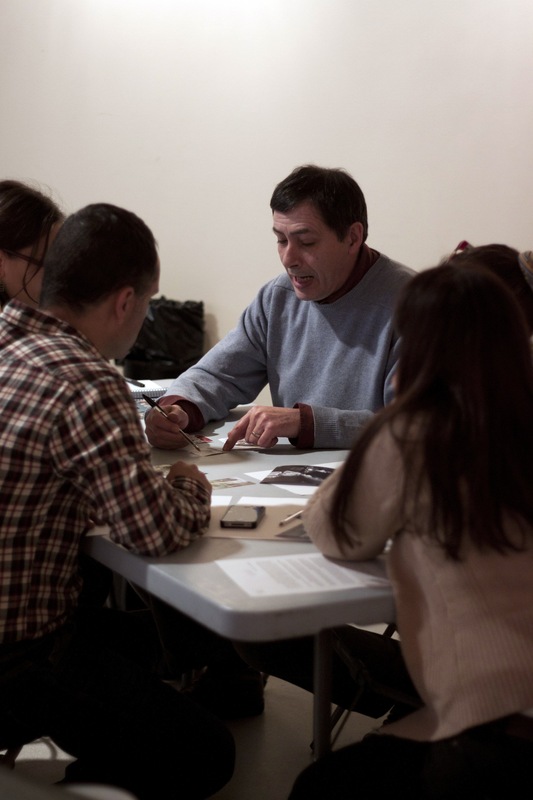 In this step of the process, the groups had the opportunity to exchange ideas and receive the feedback from all the participants. The final resource proposal of the first group was a mobile application for the users to evaluate the condition of the beaches (services, sport facilities, preservation state). The data generated would be, at the same time, useful for the participants and for the scientific community, as they could extract it for statistical analyses. The second group proposed a collection of ‘Ocean Games’. An adaptation of traditional games to the marine ecosystems’ topic: the ‘scarf game’ with fish names instead of numbers; the ‘Guess Who’ game to identify different marine species; the ‘Who eats Who’ to promote physical activity; and the ‘Memory’ game to pair the species with some of their characteristics. These activities could be offered as a gymkhana during the cultural week, or within the program of school activities. The third group devised their resource as a garbage collecting activity from the beaches and its posterior analysis. The effects of waste and chemical contaminants on marine ecosystems would then be discussed in the classroom. The fourth group proposed a game aiming to reflect on the economic and ecological questions of fishery activity. It would be a team exercise and each group would have its own fleet of boats. Using a mobile application, the groups would ‘go’ on a fishing trip during one week. After this period, the different scenarios created for each trip would be compared and discussed. Finally, the proposal of the fifth group was a ‘fishing blog’ to explore in the classroom the present and past of fishery activity. To start, students would have access to related contents and images and from here, they would identify a subject of interest: type of boats, type of fishes, how the fish is sold, the fisherman lifestyle, or the type of fishing tackles. The students would then divide into groups that would have to collect information about the chosen topic. It would be an online resource to promote the use of offline resources: archives, museums, libraries, markets, interviews. Then, the findings would be presented and discussed in the classroom in order to investigate how fishery has changed over the years. 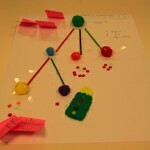 A summary of the activity would be uploaded to the blog and there would be the possibility of online feedback. 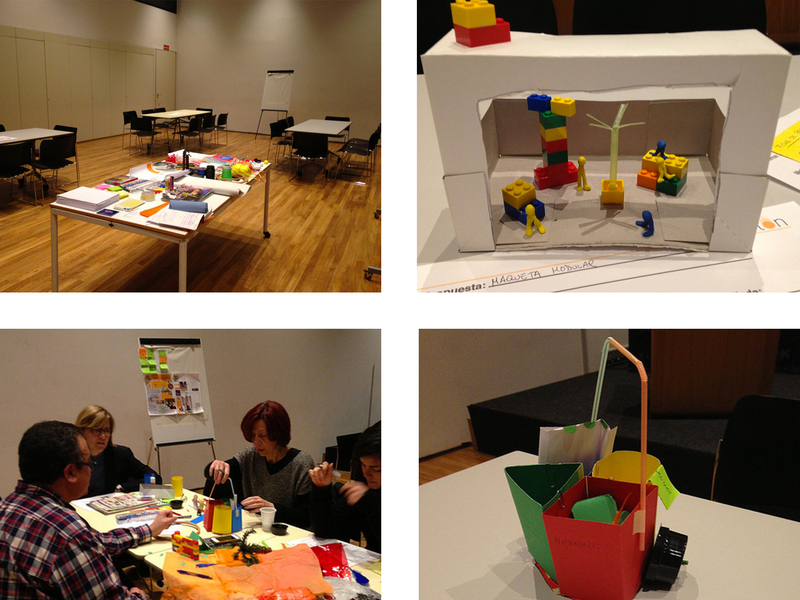 This proposal was the one selected by the workshop participants as the ‘wining’ educational resource of this session. This workshop extended a bit more than expected: it was almost dinner time when we finished. 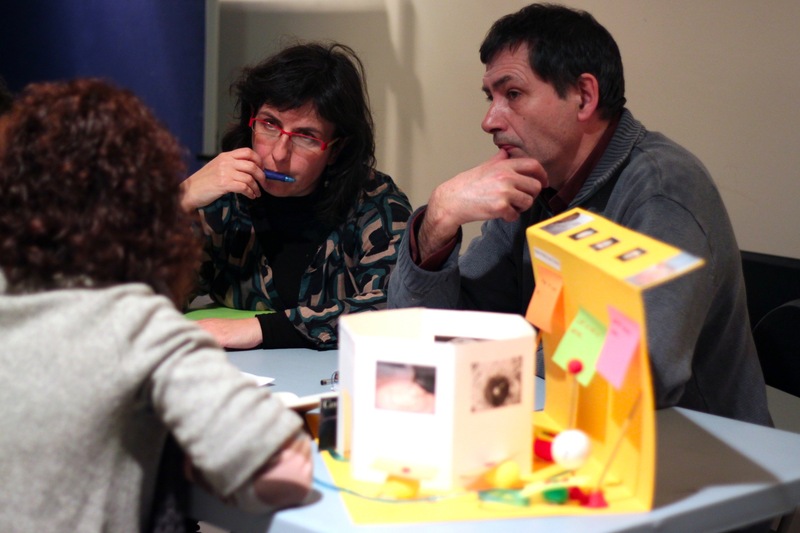 This was the last TalentLab activity (of this year) exclusively dedicated to teachers and researchers, since the next one will be also opened to the general public. Now, it is time to start working on the three selected educational resources of this second edition of TalentLab. 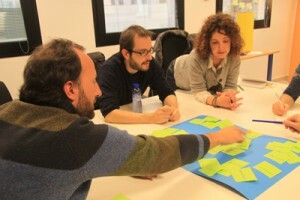 The second workshop of TalentLab, ‘Technology in Space’, took place last wednesday (January 30, 2013) at the Institut d’Estudis Espacials de Catalunya. 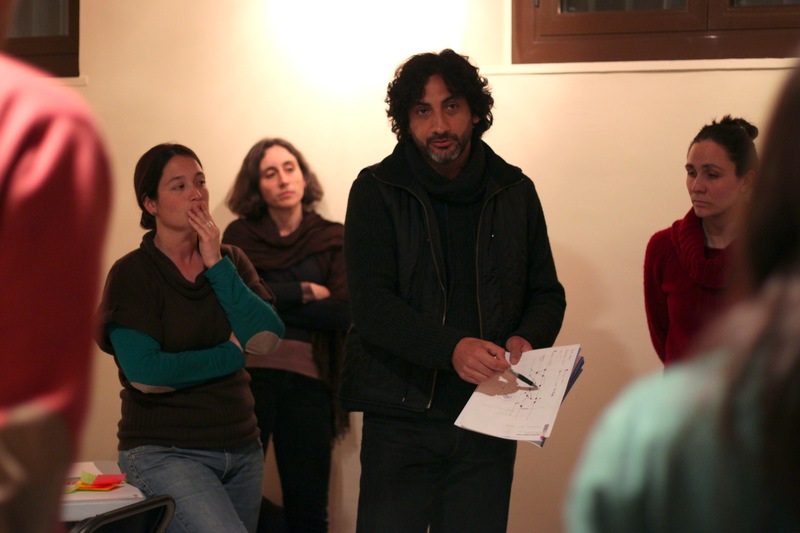 Before starting the session, one of the participants, Francesc Vilardell, explained us that it is possible to control in real time the telescope of the Observatory of Montsec (Catalonia, Spain). This is a very nice tool that allows any institution to request and reserve the telescope to use for their own projects. He also explained that other observatories in Spain also have a dedicated service to schools that allow their students to observe (live) the planets and stars. 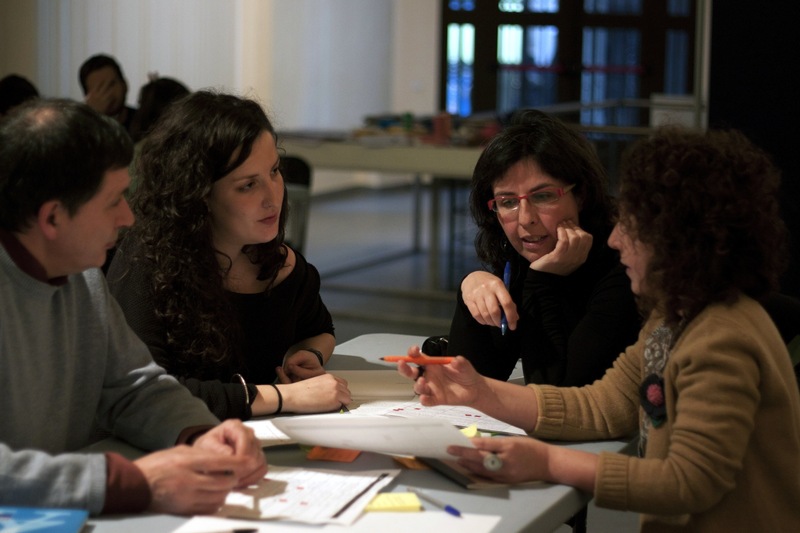 After this brief introduction, Irene Lapuente (La Mandarina de Newton) and Laura Valls (CSIC) explained how the session was going to be lead and the participants divided themselves into three heterogeneous groups of teachers and researchers. 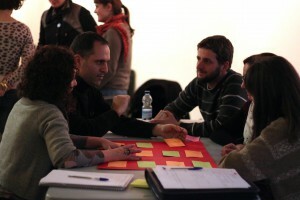 The dynamics of the session was similar to the previous workshop. 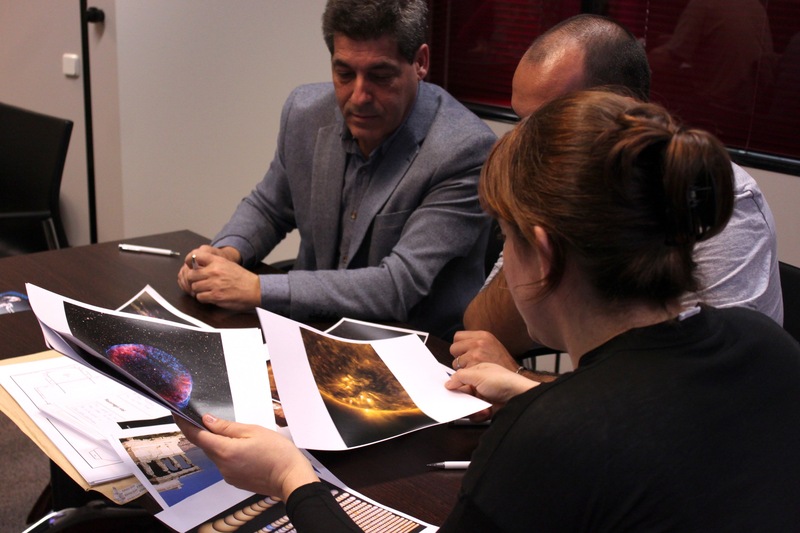 First, the groups discussed and exchanged ideas taking images related with space and technology as a starting-point. 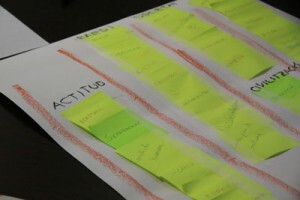 The aim of this activity was to begin creating a map of ideas, a first draft of what would become the final proposal of each group. Interestingly, there was a common topic to all the three groups: space exploration and the management of the waste generated.The first group proposed the creation of a sort of starter kit to explore space. It would be a team project in which students would have to identify what one needs for a space trip to explore other planets, and it would request the knowledge from different disciplines (history, biology, technology, …).The second group highlighted the problem generated by the permanent use of fake or manipulated images to address astronomy/space topics. This makes it difficult for both adults and students to have a realistic perception of what space is in fact. They also stressed the need to end with the egocentric view that many of us still have: ‘There’s a whole universe apart from the Planet Earth!’.The third group proposed an activity with the goal of launching a satellite into space. It would be a work group developed at different levels and in which the students would have to make a presentation of the final project. The next task was the identification of the ‘target’ students and their interests. Each group had also to identify the key points of their educative resource and the ones to avoid. From here, the participants began to define the details of their proposals and to build the final scheme or prototype. Although in this session the groups started with similar topics, the proposed formats were quite different. The first group presented an application of a space trip, designed for mobile devices. Students (12-13 years) would have to upload information and images to the platform and this would make them possible to go through the different levels of the trip. The second group presented their proposal as a web / blog. 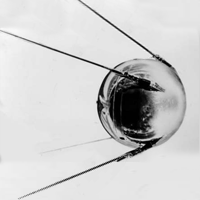 Students (high school) would have to lead a project to send a satellite into orbit. It would be a team work in which students would specialize in the different tasks necessary to launch the satellite. The webpage would have links to other websites of reference (NASA, ESA, etc.) and include, for example, an area with questions and a self-assessment. 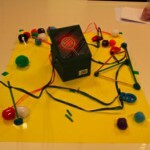 The third group presented an alternative format: a sort of board game of the goose, with an additional digital Scratch version. In this case the aim for the students would be to launch a rocket to Mars and they would have to create themselves the pieces of the game. At the end we had to choose one of the three proposals created. In this session, participants surprised us and suggested a change in the voting format. They decided that the final vote would be taken by us, ‘the organizers’. And thus, for the quality of the content and the appealing format, we chose the project of the first group. From here, we will now analyze the economic feasibility of the educative resource and also the possibility of adapting the proposal by integrating ideas from the two other projects.